There is another thing I've found in the MonoGame/Game.cs when using FixedTimeStep, there is a sleep, when the TargetElapsedTime is bigger the elapsedtime. Maybe that causes issues, when the difference is just fractional and the sleep call itself takes longer than it should actually sleep (it's also requerying NTTimeResolution everytime, I don't think this is changing during a session). Sorry; my game was always a Windows OpenGL project. Also, even when FixedTimeStep is false, the stutter occurs at the same time (regardless of the fact that several thousand more frames have elapsed before that time is reached). As for Windows 10... I'm afraid the choice to not upgrade to it was a deliberate one by me (I'm not a fan of the changes they introduce). I know many others who also choose to deliberately keep 7. However, though it may take me a long time I'll look into getting a separate installation of 10 on this machine just to be sure. I suppose I'll just live with the stutter while testing until that time. For all I know, by the time I actually finish my game we'll be up to Windows 12 and this won't be a problem anyway : P. I'm just relieved it wasn't my programming that was causing the issue to begin with. Ah i never heard of this before. That would explain why i see 58.86 or 59 instead of 60 when i time the monogame timer and i end up short always with fixed on and 60 fps. Also if i remember right win 7 uses a different underlying call to query the time deep down the rtc is not always used if a certain bit flag is set windows will switch and some of the resolutions are 16 ms. It is in that ms page i linked. Timing is absolutely critical to a smooth running game so this is where i tend to think the problem stems from. This could be hardware interupts as well like the mouse interupts interfering with the timing interupts or something thread wise but the more likely suspect is the timer. 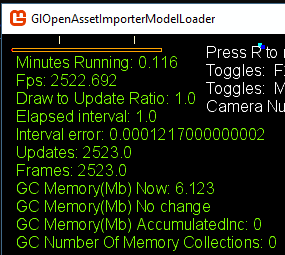 I can manually time things better myself with fixed off then on to be honest even with gameTime which does have a very small error interval so its fairly accurate. Ok so i was just thinking about this and i had a idea if its really hard to know were the problem is maybe it is possible to know when the problem is. If it is stemming from a interrupt or some gc or even a big hiccup in the timer. Then the interval error on a single frame should show a spike in proportion to the average interval error. I suppose if you were recording everything that was going on in the last frame then you could see likely culprits for the reason that spike occurred and start to narrow down the source that way. Just looked at your spec for the windows 7 machine. I had a laptop that used a similar layout and had problems. When I dug into it I found that ONLY the Intel card is connected to the display. The GTX card renders to a memory buffer which is then fed to the Intel card for display. So you get a nasty, unexpected, DMA access at the end of every rendered frame. This is run at very high priority, it is effectively a blocking operation. Maybe Windows 7 does not handle the timing of this well, though you said a friends machine had the same issue with windows 7. Did his machine have the same configuration? @reiti.net Good idea, I'll check... nope. I only have 60Hz as an option on this machine. This is my FPS tracking code. To prevent issues with my physics engine, I've made my game slow down if the FPS is ever below 30FPS (and post a message to a debug window if that happens). As far as I can tell, the deliberate "wait" is not the cause of the stutter (it only activates if the game naturally drops below 30; and I've tried running my game with the "wait" code disabled and the stutter still occured regardless). Is there anything glaringly off about this to you? // If the FPS drops below 30 FPS, post a message to the debug window and make the game wait. // Post a message to the debug window detailing when the stutter occured. // Store the time values in a Global class for convenience. // Float versions of the Timespans (save on converting). That... sounds like my situation. Did you end up fixing it? you said a friends machine had the same issue with windows 7. Did his machine have the same configuration? I don't think so. I don't really have the same level of access, so I can't say for sure off the top of my head. However, his machine is a more powerful desktop, and I think lacks the Intel part. @Paolo_Ferri What's your machine's specs? I'm seeing a pattern. I fixed it by going down to Maplins and buying a back of parts, then building my own PC. There is no way to fix this awful hardware setup. It's a terrible design, but cheap to manufacture. They don't have to have two motherboard layouts, two tool chains, two manufacturing lines. Just bolt in the extra card when needed. Hmm I still have that laptop, I will see if I can run a test for you. Yo, I'm back, sorry for the absence! Interesting update: i may be tempted to assume that this (in)famous fps problem migth come from my laptop. Something that started recently, I noticed that I encountered a very similar problem while using different technology (C++ and OpenGL). This is something I never experienced before. Additionally, I run the Monogame app I'm building on a friend's PC and to my surprise, no stuttering at all there! Old hardware tends to develop kinks over time due to wear and tear, I guess you can put it down to that perhaps... or a bad driver update? I know Maplins has closed down now, I did buy some bits and pieces in the closing down sale. I have a couple of USB boards that I have ear marked for aircraft cockpit instrument panels and a Raspberry PI with a 5" touch screen I am using as a radar warning receiver. I ran my multi-threaded renderer on the laptop I was talking about, and I got a stutter as well.